A professional letterhead is important to a professional Pregnancy Resource Center. 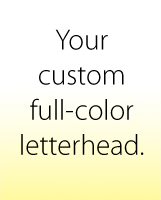 We can provide you custom, full-color letterhead at low prices. Printed on 70# uncoated paper, these are perfect for running through your printer. Or, if you want us to print a letter for you (instead of running it through your overworked printer) we can do that, no problem! Just send us some text, your logo, and we will design it for you!